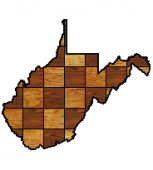 74 players competed in the 49th Annual WV Scholastic Championship, held at the Bridgeport Conference Center. Vishnu Kasireddy (Capital High) won the High School section with a perfect 4-0. 5 players were tied for second with 3 points. The Capital High School Blue team took first place team honors by 1½ points over George Washington. Jack Morris (John Adams) won the Middle School section with a perfect 5-0. Ethan Burdette (John Adams) was second at 4.5. John Adams dominated the team scores with a 5.5 point lead over Horace Mann. Ankit Patiblanda and Aiden Hoeft won the Elementary section with 3.5-0.5, having drawn each other in the final round. Weberwood Elementary took the team title. Landon Jackson swept the Primary section with a 4-0 score. Mountaineer Montessori had the highest team total. This entry was posted in Results on March 18, 2018 by wvchess.